A selection of the Photograd community come together for PhotoEast 2018 to present work around the festival’s theme of Belonging | On display in the University of Suffolk’s Waterfront Building from 6pm Thursday 24th May - 6pm Sunday 24th June. The Ipswich waterfront will be home to photographers who explore the theme of belonging in their work and Photograd featured graduates have come together to join in with the celebrations. A collective of 12 photographers are representing Photograd and honouring the theme of Belonging at PhotoEast's second festival. Having been given one long wall in the universities Waterfront Building, Photograd have curated a varying sequence of work that is bound by these similar themes and attitudes. Differing print sizes entice the viewer to migrate through the space to view work at their own pace. Digital copies of the full catalogue accompanying the Photograd exhibition can be found in our shop. Each of the photographers in this exhibition have defined and secured the theme of Belonging in distinctive ways. Tom Owens studied at the University of Suffolk itself and graduated in 2014. Tom has continued to push his work since finishing his studies and presents here a new series, Estuarine Mud. "This series is an extension of my successful Edgelands series. I repeatedly visit the same locations when making my work and it was a return visit to the source of my Edgelands project brought about by radical reshaping of the derelict factories at Cattawade to ready the site for a new railway depot that brought the creek at Cattawade into sharp focus. 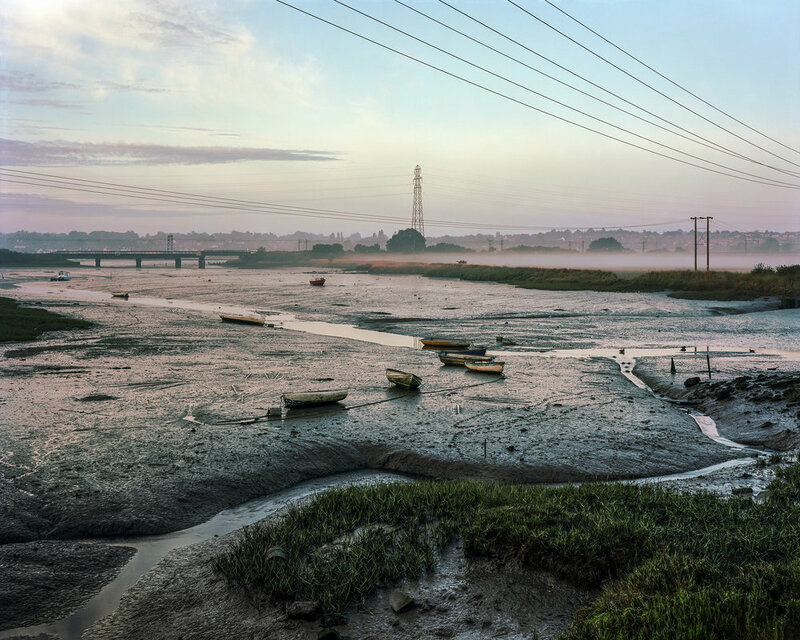 The series is shot from both sides of the Stour Estuary but only at dead low water on spring tides and with little or no wind. Most of the images are very early morning or just before sundown." The exhibition can be seen at the University of Suffolk’s Waterfront Building until Sunday 24th June before it makes its way to Norwich. University of Suffolk, Waterfront Building. The brilliant PhotoEast team are back with an exciting festival planned for 2018! Head over to their website to find out more. Photograd made it to a year old this week and celebrated with an exhibition at the University of Suffolk. The show has been home to work by some of the featured photographers on the platform in the last year, but sadly it has to be taken down this week. Many of the prints are being donated to the universities final year photography group who are currently fundraising for their two final shows. We really hope the donated images can help them on their way. See the featured graduates who have helped us celebrate alongside some installation shots of the exhibition here. We know that some of you were able to visit Ipswich and see the exhibition for yourselves. We've created an online version of the catalogue for those who couldn't make a visit. You can find it here.